Ascending Butterfly: Kohl's 'LC Lauren Conrad' collection review and giveaway! Kohl's 'LC Lauren Conrad' collection review and giveaway! This giveaway is now CLOSED. Thank You so much to our wonderful sponsor Kohl's! We would love to work with you again! The winner has been notified, upon confirmation we will post the winner's username here and provide a winner's announcement on the home page. Remember: There are still some great giveaways active on the upper right hand side of the page! New LC Lauren Conrad collection offers chic, contemporary style at an incredible value! Kohl's Corporation announced the exclusive launch of LC Lauren Conrad, a contemporary lifestyle brand that launched in the women's department in approximately 300 Kohl's stores and Kohls.com this October. The brand is ultimately planned to expand to all stores nationwide. 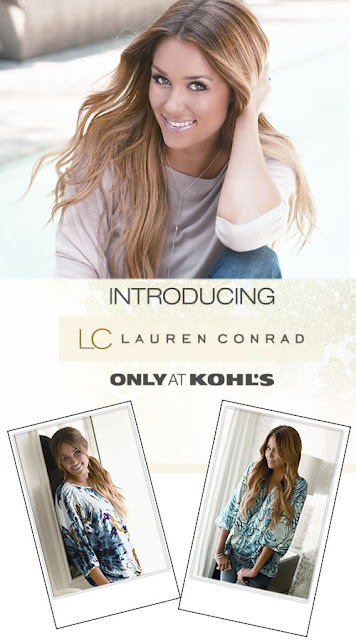 Licensed under a long-term agreement by Blue Eyed Girl, Inc., Kohl's will be the exclusive U.S. retailer of all LC Lauren Conrad merchandise. At launch the brand will consist of apparel and may expand into additional categories such as footwear, jewelry, handbags, intimates and sleepwear. Retail prices will range from $20 to $60. "Partnering with a successful national retailer like Kohl’s supports my mission to make great clothing accessible to young women everywhere,” said Lauren Conrad. “The collection is a reflection of my personal style and will offer fresh, California Casual designs at an affordable price." WIN IT! - Thanks to our friends at Special Ops Media one Ascending Butterfly will have the chance to win a $25 Kohls Gift card to purchase your favorite piece from the LC Lauren Conrad Collection! Please follow directions or you will be disqualified! All comments are moderated, they may not appear on the site right away (comments like "I want this or I want to win" will not be entered). You have from Saturday, November 7, 2009 until Tuesday, November 17, 2009 at 11:59 PM (EST) to comment and be entered for a chance to win. Winner will be announced shortly after Friday, November 20th! I would get this blouse, so cute! Follow @Tracy_Iglesias on Twitter- Naddez. I voted for you on Caroline! I voted for your Downy Scent today (11/9)! Daily vote for Ascending Butterfly scent(62) hope you win. I follow under "on wings of silver"
I twitter follow as Elkaye. I voted for your Downy Scent today (11/11, vote #73). 1- I am a follower of the AscendingButterfly blog, as listed in my blog profile. Not sure if my follower name will show as bmh2448 or gigatron??? 1) I follow the AscendingButterfly blog under the name ASHays. I voted on your Downy Scent today (#84)! I voted for Ascending Butterfly on Divine Caroline! Good Luck! I was vote #93 today for your Downy Scent! Let's try again. Thanks for giving me a chance to redo, even though if you read your entry directions carefully, they do NOT say the piece has to be from the LC collection. It may be inferred from the statement about how the card can be used, but it isn't listed as a requirement. I voted for your Downy Scent (#98) today! Vote #110 for your Downy Scent today! I like these - http://www.kohls.com/kohlsStore/landingpages/lclaurenconrad/bottoms/PRD~512897/LC+Lauren+Conrad+Boyfriend+Jeans.jsp , there's a great dress too! I'm a fan of Kohl's on FB. voted for you on downy simple pleasures. I am a follower. email is dahlia -at- tmlindsey d0t com. I am in love with the Dolman Sweater: http://www.kohls.com/kohlsStore/womens/brandswomen/lc/tops/PRD~517615/LC+Lauren+Conrad+Dolman+Sweater.jsp. I have a thing for sleeves.